The effects of climate change on coral reefs are well known. We know that as the climate changes, the ocean temperature is rising, and that rising temperature is leading to coral bleaching. We also know that as the carbon dioxide concentration in the atmosphere increases, the ocean is becoming more acidic, and that is reducing coral growth (as more acidic water impairs the growth of skeleton by corals). Does rising temperature also affect coral growth, and does ocean acidification also affect coral bleaching? Well, rising temperature (beyond a certain limit) has also been irrefutably found to reduce coral growth. But the effects of ocean acidification on coral bleaching are less clear. In some studies, ocean acidification increases coral bleaching. However, in other studies, ocean acidification does not seem to have an impact. To try to clarify this problem, I performed an experiment at the Hawaii Institute of Marine Biology from November 2014 to January 2015. Collaborating with local researchers (Dr. Ruth Gates, Dr. Ross Cunning and Chris Wall), we exposed colonies of the lace coral, Pocillopora damicornis, to two levels of ocean acidification. One of these levels (7.95 on the pH scale) will be seen in the near future whilst the other level (7.75 on the pH scale) is what the world could see towards the end of the twenty-first century, if we don’t reduce greenhouse gas emissions enough. At first there may not seem to be much between 7.95 and 7.75, however the pH scale is logarithmic (not linear), so a decrease of 0.2 pH units actually amounts to a huge increase in the level of ocean acidification. After two months of exposure to these two levels, we then divided the corals at each level of ocean acidification into a further two groups: one that would experience no increase in water temperature (remaining at 24°C), and one that would experience an increase of 6°C (to a final temperature of 30°C). 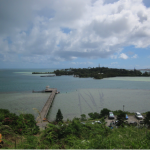 An increase of that level is often sufficient to cause coral bleaching. 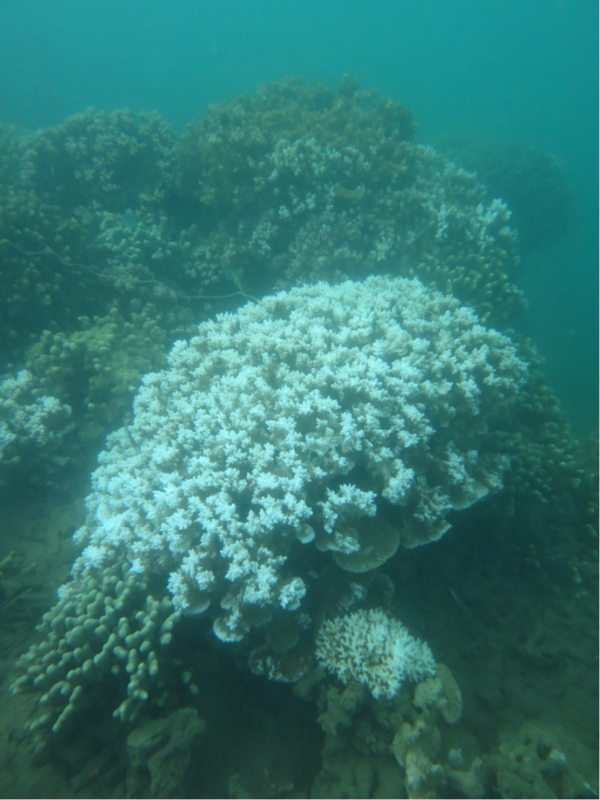 What we wanted to know is, will coral bleaching be worse in the corals that experienced end-of-century ocean acidification, compared to those that experienced less ocean acidification? 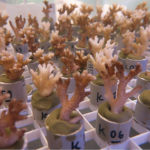 After one week of temperature exposure, corals were snap frozen, preserving their biology for later analysis in a laboratory. Using an airbrush of the same type used by artists, we removed the thin layer of tissue from the surface of each coral fragment to collect the single-celled algae that live within the tissue. As photosynthetic organisms, these algae provide the organic molecules that the coral tissue uses for energy. It is the loss of these algal cells from coral tissues that is the cause of the whitening (bleaching) of the coral during high temperatures. Using a microscope, we counted the number of single-celled algae from the tissue of each coral, and then calculated the total number of algal cells per square centimetre of area of coral tissue. This provided a measure of coral bleaching that could be compared between all the corals in our experiment. 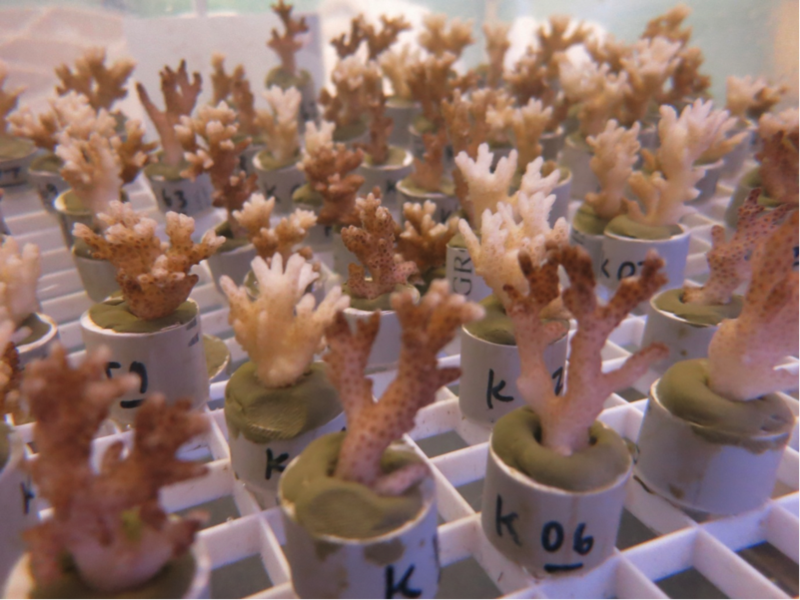 In statistical analyses now underway, we are examining whether there is in fact more coral bleaching in those corals exposed to high ocean acidification compared to those that experienced less ocean acidification. This information will help us to plan for the impacts of climate change on coral reefs, and will further help to focus attention on the plight of marine ecosystems in our changing planet. 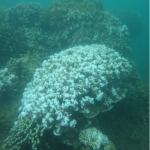 No better reason could be found for this research than in September 2014, when a coral bleaching event occurred on reefs beside the Hawaii Institute for Marine Biology due to high water temperatures. Scientists and coral reef managers in Hawaii are now planning for a second bleaching event at the same location, anticipated to occur this coming summer in 2015. Coral micro colonies used in the ocean acidification experiment. 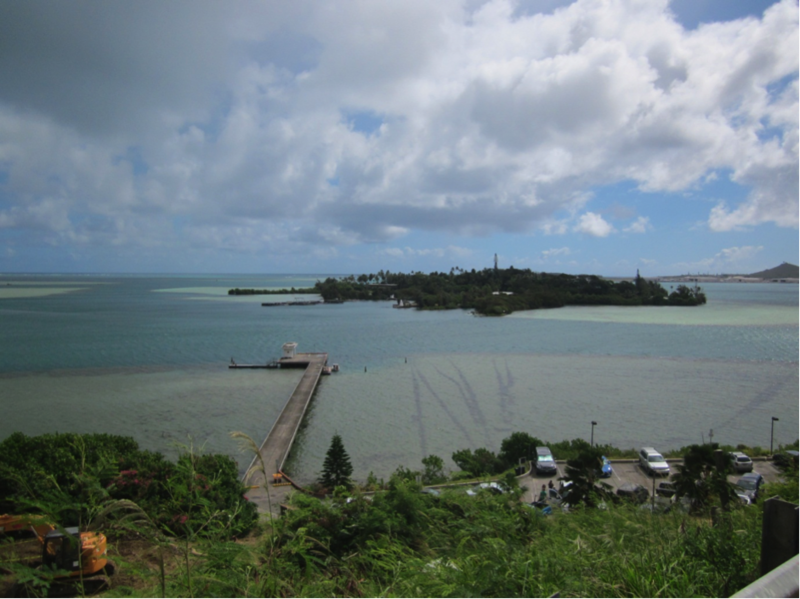 The Hawaii Institute for Marine Biology in Kaneohe Bay, Oahu.